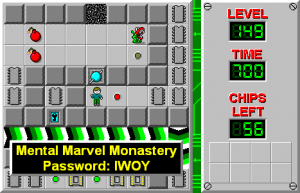 Mental Marvel Monastery - The Chip's Challenge Wiki - The Chip's Challenge Database that anyone can edit! The teeth at the start is meant to reference Learn from CCLP2, requiring it to hold a brown button down before killing it. The force floor section following the ice slide on the right, resemble both BuggyWall and Force Square, from CCLP2 and CC1 respectively. The blue wall section below that references Mishmesh from CC1. The SE corner of the level references Mining for Gold Keys from CCLP1. The SW corner of the level is a near direct copy from the same corner of Playtime from CC1, with the paramecia being placed on a trap instead of force floor to prevent slide delay. The middle mechanism of the level references Hmmm! from CCLP2. To the left of that mechanism, is a slight resemblance to Blue Blocks from CCLP3. The fireball at the very end of the level is a reference to both Lemmings and Traps II. 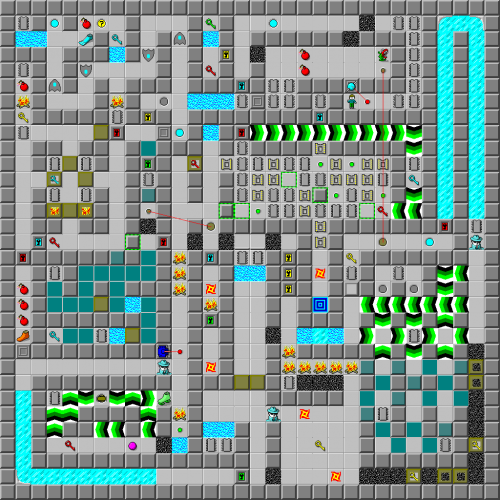 The socket section is a reference to Toggle Bust from CCLP3. The ice area at the top-right looks like the end of Miss Direction from CC1. The two fireballs circling the yellow key is taken from Nuts and Bolts from CC1. The gravel and fire section immediately above is similar to Fireflies, the fake last level in CC1. The hint is from Counter Clockwise from CCLP2. The block section on the left is based on Corridor from CC1. The top-left section with gliders and water is similar to Rat Race from CCLP1. Two blocks each used to fill in a water space to collect two chips are a callback to Seeing Stars from CC1. This page was last edited on 29 March 2019, at 09:28.